increase more rapidly in 2014." In other words, the long-delayed period of bounceback growth is now at least visible on the horizon. Here's the forecast in pictures. 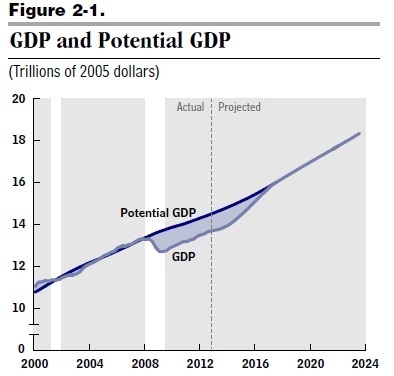 "Potential GDP" refers to how much an economy could produce with full employment of workers and productive capacity. 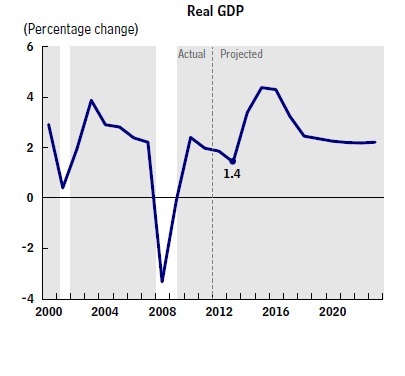 The blue line shows growth in potential GDP; the gray line shows the actual course of the economy during the recession and its aftermath. Notice the catch-up growth, bringing the economy back to potential GDP. You can also see the catch-up growth in the CBO predictions for the annual growth rate of GDP. 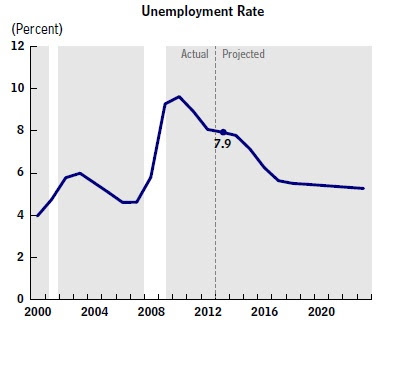 As the catch-up growth arrives, the CBO is also predicting that the unemployment rate will drop briskly. In addition, some measures of the grim economy will start to reverse themselves. 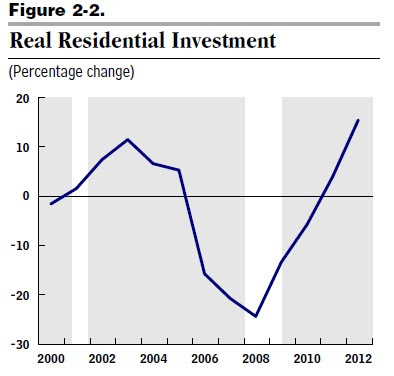 For example, real investment in residential housing (that is, in building and remodeling houses), after several years of negative growth, has moved back to positive territory. The underlying story here is that when a recession is accompanied by a financial crisis, the economic bounceback can be painfully slow. When households and firms across the economy are all feeling that they have borrowed too much, and need to get their financial houses back in order, it takes time. The depth of the U.S. recession has actually been somewhat shallower and less prolonged than the experience in many other countries when they experienced the double-whammy of financial crisis and recession, as I discussed here. But by fits and starts, the economic bounceback process does eventually work its way forward. Can Africa's Energy Growth Be Green? A Future of Low Returns? Why are U.S, Firms Holding $5 Trillion in Cash? Email Spam Declines? Or Just Migrates? How Well Do U.S. Students Read?